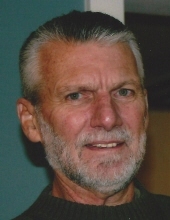 Steven W. Middaugh, age 69 passed away peacefully at Richmond Medilodge Nursing Home on March 21, 2019. Steven was born on June 4, 1949 to William and Luella (Portice) in Rogers City, Michigan. He joined the United States Marine Corps in November, 1969 serving 3 years as a metal worker and forge shop foreman. He was Honorably Discharged with a National Defense Service Medal and Rifle Expert Badge in March 1971. Steven then started to work for Detroit Edison as a welder and had a “side gig” called “Steve’s Portable Welding. When he left DTE, Steven started to teach welding at Macomb Community College. He then moved to Florida and continued to teach welding along with working for Disney at night doing welding. Steven also enjoyed hunting deer, cooking, exercising, and anything to do with cars. Steven is survived by his children Stacy (Shane) Roberts of Romeo, Stefanie Middaugh of Florida, and Steven Middaugh of Sterling Heights. Siblings; Mitch (Joan) Middaugh and Beverly (Bill) Burgess. Grandchildren Shayna and Shannyn Roberts. Sister in law Sherry Middaugh. Steven was preceded in death by his brother Randy Middaugh. Funeral services will take place on Wednesday, March 27, 2019 at 11 AM at Grace Lutheran Fellowship Church with Pastor Eric Majeski officiating (7525 32 Mile Road Romeo, Michigan 48065). Visitation will be on Tuesday, March 26, 2019 from 2-8 PM at the Henry M. Malburg Funeral Home. To send flowers or a remembrance gift to the family of Steven W. Middaugh, please visit our Tribute Store. "Email Address" would like to share the life celebration of Steven W. Middaugh. Click on the "link" to go to share a favorite memory or leave a condolence message for the family.